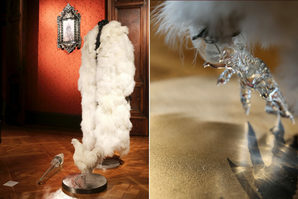 Belgian artist Koen Vanmechelen (1965) is an internationally renowned, conceptual artist. His groundbreaking work deals with two main themes, biocultural diversity and identity and includes three projects: the ʻCosmopolitan Chicken Research Projectʼ, ʻCosmogolemʼ and ʻThe Walking Egg’. Central in his work is the gallus gallus or chicken. 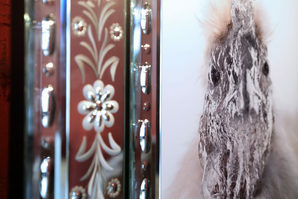 Over the past decade Koen Vanmechelen has collaborated with scientists from different disciplines. That earned him an honorary doctorate at the University of Hasselt (2010). In 2013 he won the Golden Nica Hybrid Art. 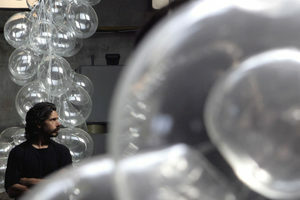 Vanmechelen uses a plethora of creative tools for his work: painting, video, installations, innovative 3D-techniques, sculptures and also glass. 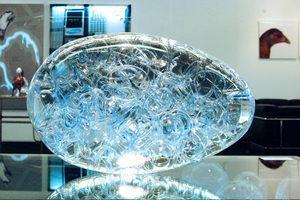 Central in Vanmechelen’s glass work is the concept of transparency. It allows the artist to clarify and reflect upon hidden realities and give them a place in his enigmatic oeuvre. Glass is also important for Vanmechelen as it is a living material, brought forth by the four elements, earth, water, air, and fire, which used to combine art and science. This is also a constant aspect in the universe of Vanmechelen. This pre-Christian belief connects the glass work with ancient traditions and philosophies. Also important: a glass work is never the result of an individual, it is always teamwork, a synthesis of ideas and experience. 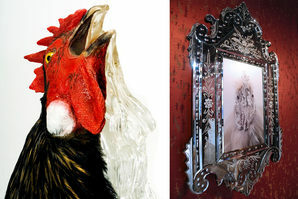 Besides from the works and installations in glass, the artist also translated his fascination for this material in a specific project, one that also expresses the core theme from the Cosmopolitan Chicken Project, biocultural diversity, and translates it into a lucent form. In his ‘Crossings in Glass’ project, the artist blends the characteristics of glass artifacts from various national traditions by mixing the work of different glass masters. 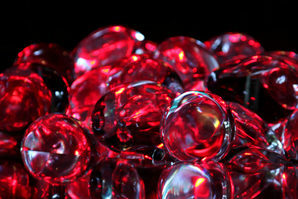 The result is a ‘genetic’ mix of various glassblowing traditions that creates unexpected and transgressive works. 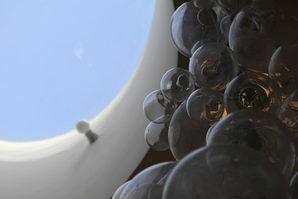 In this project, different cultures and glass breeds are mixed with Italian glass.